My students love changing the date on the calendar. They always have. Now, they also love changing out monthly calendar headings too. Why, because each month a new picture of our class is unveiled. I am always snapping pictures of my students when we take our field trips, or earn a school incentive. I used to always wonder what I would do with all of their pictures, so I created these free editable monthly calendar headings. 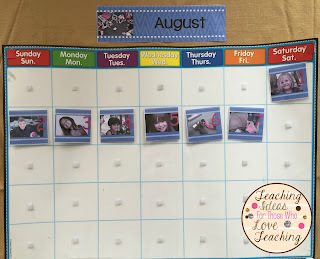 Each month has a spot for you to add pictures of your class in action. It's a great way to use all of the pictures you take of your students on field trips, at recess, etc. The best thing about these is that you simply click on the photo box, then upload the photo you want to display. 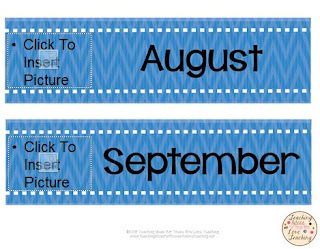 Print the calendar headings, laminate, and you're ready to go. My students LOVE seeing photos of themselves.